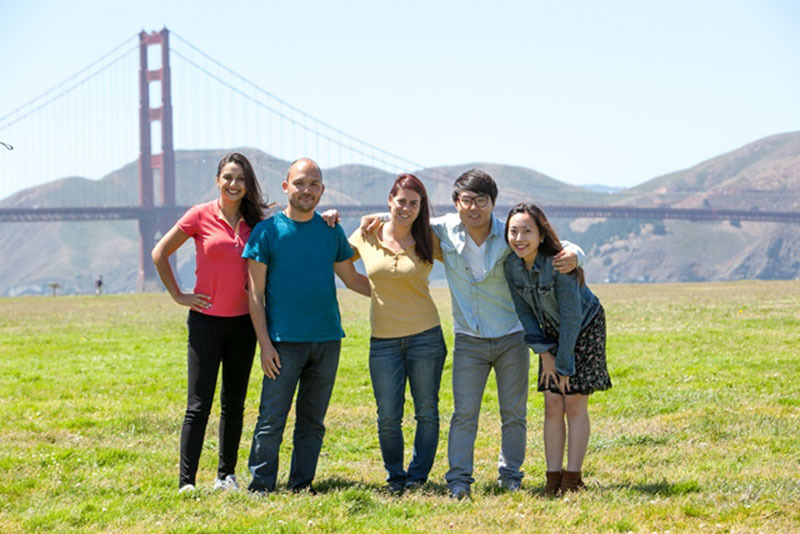 Learn English in San Francisco at our partner language institute, St. Giles. Found in the financial centre of San Francisco, St. Giles is close to a number of shops and restaurants.The enthusiastic, highly professional teachers and the unique teaching methods guarantee effective English study through a relaxed but hardworking atmosphere. This course of 28 lessons per week consists of grammar, vocabulary building, reading, writing, listening and speaking skills. Small classes (maximum 12 students) guarantee that you will receive a high level of personal attention and maximum learning opportunities. In the morning you have 4 lessons and in the afternoon 2 lessons (except for Fridays). Minimum course length is one week. The interactive teaching method engages you into the learning process so that you learn communication skills and develop confidence quickly. The school offers 6 different levels, so there will be a class which is just right for you. Surcharge for half board: The system calculates the surcharge for a single room (€ 78 per person per week) , if you book half board in a double room, the surcharge is € 65 per person per week; the invoice will reflect the correct price. A private bathroom in is possible upon request (against a weekly surcharge). A private bathroom in the Kenmore residence is possible upon request (against a weekly surcharge). The price mentioned above is for an airport transfer on arrival between 07.00 and 21.00 hours. Outside these hours and on holidays the price of a transfer is € 120 p.p. In case of delay there is a surcharge of € 28 per hour (to be paid whilst there). Text / grammar books are not included, the price depends on the language level. This intensive morning course of 20 lessons per week consists of grammar, vocabulary building, reading, writing, listening and speaking skills. Small classes (maximum 12 students) guarantee that you will receive a high level of personal attention and maximum learning opportunities. The lessons are In the morning (from 9.00 - 13.00 hours) If you choose to take your lessons in the afternoon, this will be cheaper. Minimum course length is one week. This intensive afternoon course of 20 lessons per week consists of grammar, vocabulary building, reading, writing, listening and speaking skills. Small classes (maximum 12 students) guarantee that you will receive a high level of personal attention and maximum learning opportunities. The intensive course lessons are In the afternoon (from 14.00 - 17.50 hours). Minimum intensive course length is one week. The business English course (20 lessons per week) is recommended for students who use English mainly in their professional lives. The business english course lessons cover the language skills needed in the work place such as negotiating, telephoning, presentations, writing reports, etc. Participants have to be at least 21 years old. Minimum stay of 1 week. Minimum age for this course is 21 years and the minimum level is A1. The Cambridge exams are recognised throughout the world. The exams test your ability to communicate effectively and with confidence. You can take the official exam at the end of your Cambridge exam preparation course when you are well prepared to achieve you best result. You can do the Cambridge exam course for 8 up to 12 weeks, with 20 or 28 lessons per week. Please check carefully the correct starting date for your level and duration (or contact us in advance). Prices of the Cambridge exam courses do not include materials or the exam fee. This English proficiency test is recognised throughout the world by universities and businesses as a measure of English proficiency. It is also required by most U.S. colleges and universities for the admission of international students. In addition, many companies will accept your TOEFL score as proof of your English abilities. The exam training of 20 lessons per week is being helt during 6 weeks. The course consists of 20 lessons in groups with a maximum of 12 students. The school will help you register to take the official TOEFL exam at the end of your 6 week course. Prices of the TOEFL course do not include the materials nor the exam fees. With the TOEFL courses you might need to book an extra night or extra weeks of accommodation, due to the exam dates. Prices on request. This course combines 20 lessons of General English with 8 group lessons in the afternoon dedicated to “English for Business”, which help students to improve their English and also develop specific English skills for a business environment, such as giving presentations, writing reports and compiling emails. Students can also add this course as a module on a long-term International Semester Course and can choose to prepare for the Cambridge Business English Certificate (BEC) during the course. Learn English in San Francisco and stay with a real American host family in a single or double room. The host families usually live 10-40 minutes from the English school (by public transport). Host familiy accommodation in San Francisco includes either bed and breakfast or half board. In an executive host family you stay in a single room with a private bathroom and you can choose between bed and breakfast or half board. The 'USA residence club´ is centrally located in downtown San Francisco. The language school is just a 15 minute walk away. The residence also serves as a hostel for tourists. The students from the school are staying on the upper floors. The residents can use the launderette (charges apply) and there is free wifi available. All rooms have a fridge, microwave and television. ou will share the bathroom with your fellow residents. It is possible to book a room with a private bathroom by paying a supplement.You will stay in the residence on a bed& breakfast basis, but you can make use of the communal kitchen or eat in the cafeteria that belongs to the residence. The Kenmore residence combines the services of a hotel with the conveniences of an apartment. The distance to the school is 15 minutes by bus. There is a 24-hour reception and a communal TV room, library, free wifi and residents can use the launderette (charges apply). You can choose a single or twin room. You will share the bathroom with your fellow residents. It is possible to book a room with a private bathroom by paying a supplement. You will stay in this residence on a half board basis. There is no kitchen in the residence. Discount of 20% on an intensive language course in San Francisco: California's 4th largest city!